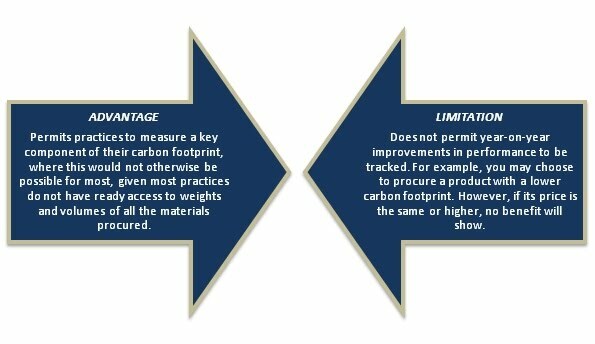 The most challenging aspect of carbon footprinting and the most difficult area in which to achieve emissions reduction is materials procurement. GP Footprint Reporter has been designed to be as useful as possible for the broadest cross section of general practices. As discussed in the GP Footprint ReporterTM Quick Start Guide, the Supply Chain tab has been included within GP Footprint Reporter to permit practices to measure a key aspect of their carbon footprint, where this would otherwise not be possible. This has been done using expenditure data, which has both an advantage and a limitation, as outlined in the diagram below. However, this should not dissuade you from taking action to procure more sustainably, as real on-ground benefits can still be achieved. do they have an environmental policy? do they know what their carbon footprint is? what are they doing to minimise the impact of their activities? Simply asking these questions will begin to change the way that your suppliers think and respond to their customers. The British Standard's Institute has also recently released a 'Principles and Framework for Procuring Sustainably Guide', which is available for purchase.